Good morning! 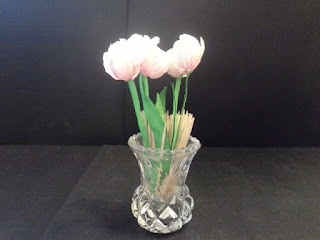 Kathleen here today with a bouquet of tulips that are all in bloom this time of year in California where I craft! 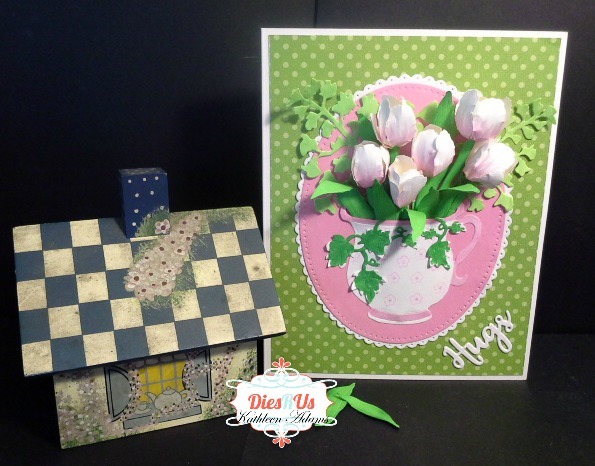 I love making flowers with Elizabeth Craft Designs Garden Notes dies. Over at DiesRUs they carry a huge collection of these dies including the latest release! I cut both die pcs. out of white cardstock and colored with a green Coptic Marker leaving white spaces to mimic variegated ivy. Cut both pcs. either from green cardstock or as I did with white cardstock and colored them with a Copic Marker to get the color I needed to work with the other green papers I chose (mats). I cut only the "cup" pc. 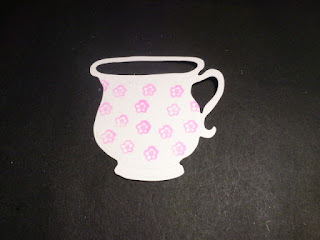 and stamped with a tiny little flower stamp I have and colored the top and bottom rings on the cup with a pink Copic Marker. Using the largest die from ECD 1173 Dotted Scallop Ovals cut with white cardstock. Using the second largest die from: ECD - 1113 Stitched Ovals cut with pink cardstock. To assemble the card score an 8.5 x 11" piece of white cardstock at 5.5", fold for a "book fold card" and trim to 5.5 X7". Cut a rectangle from designer paper that measures 5.25 x 6.75" and adhere to the front of the white base card. Adhere the pink oval to the white oval. 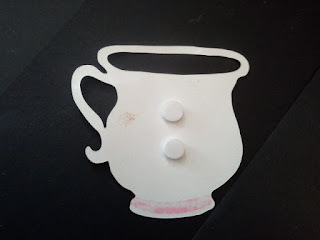 Then adhere the cup by first putting two foam dots (leave protective back on the dots). to the back of the cup as pictured below and then adding glue to the bottom edge only of the cup. Adhere the cup to the pink oval 1/2" from the bottom. Leave the sides and dots unglued right now. Now start putting your bouquet together through the cup opening until you like what you see. Now start gluing your bouquet stems in place. Next remove the backing from the foam dots and add glue to the rest of the cup edges. Adhere the cup now by first pressing the cup over the foam dots. Then while carefully pushing the sides in a little to accommodate the dots hold the glued sides down. Thanks so much for stopping by and don't forget to join in on the fun over at the DiesRUs Challenge Blog. There's a new challenge theme offered on the 1st and 15th of each month and one lucky randomly drawn winner will receive a gift voucher prize to the Dies R Us Store. For your convenience, all the important Dies R Us links are provided below. Love, love, LOVE what you have done with those tulips. Such a sweet, spring-y card, cleverly done with the cute little teacup. Absolutely beautiful project Kathleen! Awesome inspiration ... thanks!